Place your cappings in a mesh straining sieve over a large bowl. Leave this covered with shrink wrap over night to allow the extra honey to filter through the sieve into the bowl. 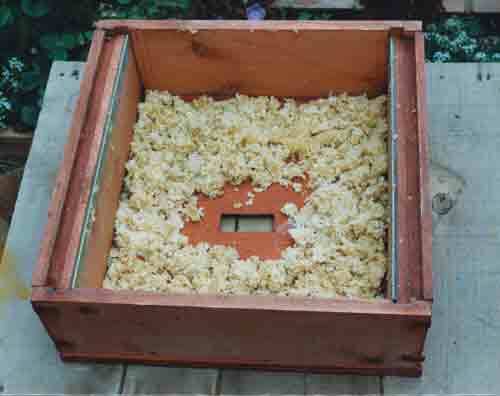 The following night remove the roof of your hive and place the wax cappings in a large circle around the top of the cover board. Place a super or brood box on top to allow extra space and place another cover board on top of that. Place the roof back on. Now your bees will smell the honey capping, come up through the first cover board and rob clean all the honey from the cappings bringing it all down into the brood box. After a few days you can remove the cappings that will be completely clean and dry. The cappings can then be melted to make polish, candles or cosmetics.